You probably know that May in Central Indiana means racing -- but did you know that the Indianapolis 500 is not the only race in town? Lucas Oil Raceway in Brownsburg has its own Memorial Day weekend race tradition. For 70 years, the Night Before the 500 race has kicked off a great weekend full of racing excitement in the Indianapolis area. Beginning in 1946 at the now closed 16th Street Speedway, the race traveled around the state, visiting Lucas Oil Raceway frequently before finally settling there in 1980. This year brings a lot of big changes, however, the racing is still as thrilling as ever. Probably the biggest change that long-time attenders of the race will notice is that the Night Before the 500 is no longer the Night Before the 500! it&apos;s now the Day Before the 500, and the action starts with practice at 8 a.m. Qualifying for the three different races begins at 9:50 a.m., and racing starts at 12:15 p.m. on May 23. The new time change will be an adjustment for some, but it allows race fans to take in as much of the action as possible. It also allows visitors to the area to enjoy even more of the Indiana racing experience, a tradition that extends far beyond the Indianapolis 500. 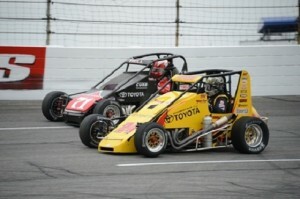 Another change this year is that the race will be headlined by the USAC Silver Crown series, rather than the USAC National Midgets. Also returning are the Mazda Road to Indy divisions USF2000 and Pro Mazda. Last year&apos;s winner, Tracy Hines of New Castle, Indiana, is expected to be back again this year to race for the checkered flag. Past champions Bobby Santos and Tanner Swanson are also expected to compete, guaranteeing an edge-of-your-seat thrilling experience for fans. General admission tickets are $25 for adults and $10 for children ages 5 to 12. Kids under 5 are free. For $40 you can purchase a pit pass, giving you access to all the behind-the-scenes action. You can purchase tickets at the box office or online.